By tapping into an existing network of climate groups, Sunrise Movement has been able to build momentum for a Green New Deal at rapid pace. 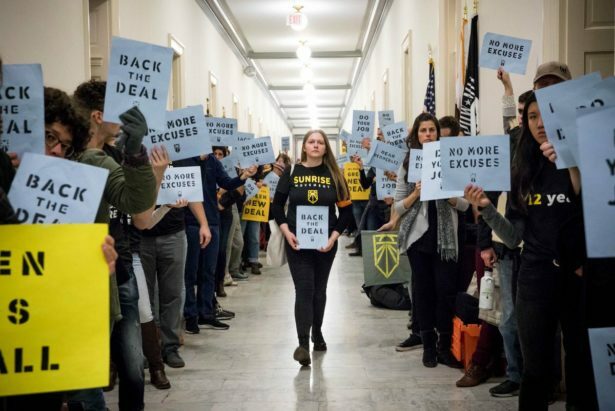 Last week over 250 young people converged on Senate Majority Leader Mitch McConnell’s office in Washington, D.C. for a sit-in marking one of the latest escalations in the youth-led campaign for a Green New Deal. 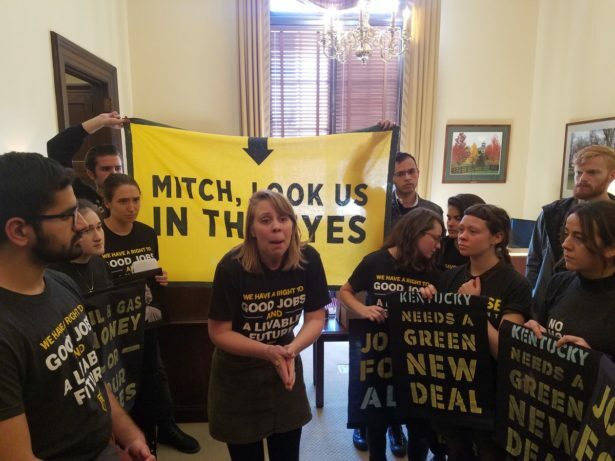 The action, led by youth from McConnell’s state of Kentucky, was planned in direct response to what they saw as his attempt to quash a Senate resolution on the Green New Deal by scheduling a premature vote. The next day young activists descended on Senate district offices around the country. Just a couple days later, in a stunning sign of the movement’s effectiveness, McConnell announced he would postpone the Senate vote until much later this year. The idea for a Green New Deal — a massive nationwide investment in jobs and infrastructure that would shift the United States to a clean energy economy while rapidly cutting carbon emissions — took off in November when hundreds of young activists held a sit-in at the office of Rep. Nancy Pelosi less than a week after the 2018 election. Fifty-one were arrested while calling on Pelosi and other Democrats to establish a Select Committee for a Green New Deal with power to advance legislation. A few weeks later, on Dec. 10, over a thousand youth flooded the halls of Congress again. They lobbied over 50 Congressional offices and held sit-ins at the offices of Pelosi and other key Democratic leaders. A total of 143 were arrested. The leading force behind this wave of action is an organization called Sunrise Movement, which launched in 2016 with the immediate goal of making ambitious climate action a key issue in last year’s midterm elections. In the longer term, Sunrise seeks to use high-visibility actions that put pressure on candidates and elected officials as a strategy for building power and rallying public opinion behind a Green New Deal. After the election, Sunrise immediately began mobilizing to put Democratic leaders on the spot over years of failure to address the climate crisis. With Democrats taking back the House of Representatives in November, some observers saw a chance to advance bold progressive policies. But when it came to climate change, Sunrise organizers worried Democrats would merely pursue the cautious strategy they have used in the past — most notably in 2009-2010, when a weak cap-and-trade bill riddled with corporate giveaways passed the House only to fail in the Senate. Sure enough, Democratic leaders announced plans to resurrect a version of the House Select Committee on Energy Independence and Global Warming, which was first established in 2007 and has no authority to advance legislation. Sunrise, along with new members of Congress like Rep. Alexandria Ocasio-Cortez of New York, advocated the alternative Select Committee for a Green New Deal. While the Green New Deal Committee was never formed, from the perspective of advancing bold ideas about climate legislation this may not matter. Sunrise’s November and December protests accomplished their most important objective by popularizing the Green New Deal and putting both parties in Congress on notice that young activists will not be content with tepid action on climate change. On Feb. 7, Ocasio-Cortez and Sen. Ed Markey of Massachusetts introduced identical resolutions in the House and Senate formally calling for a Green New Deal. The Senate version was quickly co-sponsored by most Democratic senators running for president. Thanks to Sunrise successfully pressuring McConnell to delay his rushed vote, both resolutions remain in play. The concept of a Green New Deal isn’t new. According to Vox, the term was first used in 2007 and soon became part of Barack Obama’s 2008 campaign platform. However, while some elements of the Green New Deal — like pairing clean energy with an economic stimulus — made modest progress during Obama’s presidency, the administration never seriously attempted the type of sweeping policies today’s Green New Deal advocates are demanding. One reason for this lack of progress in the early Obama years was insufficient grassroots support. 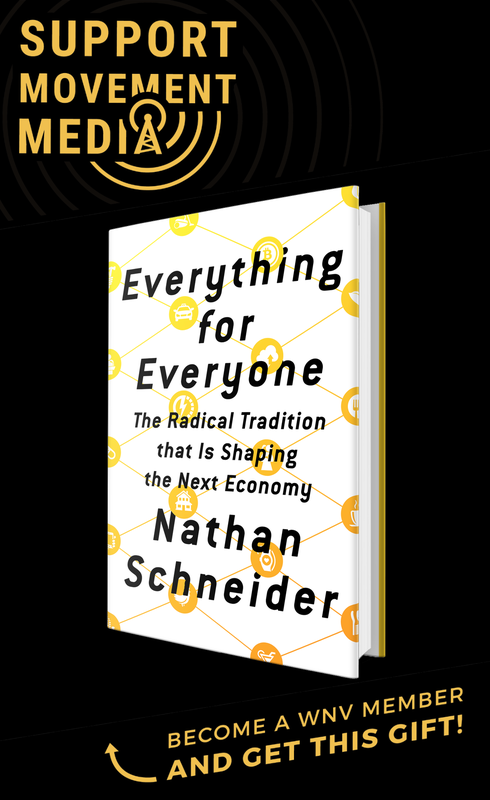 At the time, the climate movement just wasn’t large enough or politically savvy enough to create the type of massive grassroots mobilization that’s needed to transform bold ideas into policy. Today, that may have changed. From mass protests that stopped pipelines and closed coal plants to grassroots organizations advancing clean energy at the local level to a nationwide divestment campaign that galvanized students around energy justice — the climate movement has grown a lot in the last decade. Many Sunrise Movement founders got their start organizing in one or another of the waves of climate activism that helped set the stage for a powerful Green New Deal movement. A recent story in the New Republic describes how young activists involved in campaigns like fossil fuel divestment came together to launch Sunrise. They united behind a vision for a slate of policies to dramatically cut carbon emissions, while creating millions of jobs, ensuring economic security for all and combating racial injustice. Like Medicare for All, the Green New Deal is a bold progressive proposal with the potential to inspire the kind of mass support cautious Democrats in Congress have largely failed to attract for their ideas. However, in order to build that momentum Sunrise needed to grow from a small group of organizers — based mostly on the East Coast — into a true nationwide grassroots campaign. The Green New Deal movement’s rapid growth over the last few months was made possible by the existing network of climate activist groups that formed across the United States over the past decade or so. One example is the Cascade Climate Network, or CCN, a regional organization that promotes climate justice on college campuses in Oregon and Washington. Last school year, CCN organized a conference that hosted a workshop by Sunrise Movement co-founder Victoria Fernandez, who invited students to sign up for Sunrise Semester — a fellowship that engaged young people in pressuring politicians to support Green New Deal policies in the months leading up to the 2018 elections. After Sunrise garnered national attention with its November and December actions on Capitol Hill, “interest in the Green New Deal really skyrocketed,” Grimm explained. So she put out a call to other youth activists in Washington State. Over a period of a couple months they launched local hubs in several Washington communities. Among the most active is Sunrise Seattle, which held a town hall on Feb. 22 to highlight public support for a Green New Deal. Seattle Sunrise’s co-coordinators include Katz, 23-year-old Lily Frenette, and 26-year-old Sam Farquharson. They held their town hall during a Congressional recess with the hope that Washington’s U.S. senators would attend. It was part of a series of actions across the country Sunrise organized after McConnell announced the hasty Senate vote on the Green New Deal resolution. While Washington Sens. Patty Murray and Maria Cantwell were both invited to the town hall, neither managed to attend or send staff. So Sunrise Seattle visited their district offices the following week and delivered recordings of the public testimony. The youth organizers spoke with office staff, but neither senator has yet taken a public position on the Green New Deal. Over 120 Sunrise hubs have launched nationwide, from Alaska to Florida and from California to Maine. Their immediate priority has been organizing actions like the Seattle town hall and confronting members of Congress. In one of the most visible examples, video of a meeting between California middle school students and Sen. Diane Feinstein went viral when it showed Feinstein treating the students dismissively. After the incident drew nationwide public scrutiny, Feinstein backed away from plans to introduce a much weaker climate resolution that would have competed with the Green New Deal. While Sunrise welcomes solidarity from older activists, the campaign is determined to remain youth-led. After all, young people will be dealing with the effects of climate change longer than anyone else alive today, so keeping their voices at the forefront makes sense. 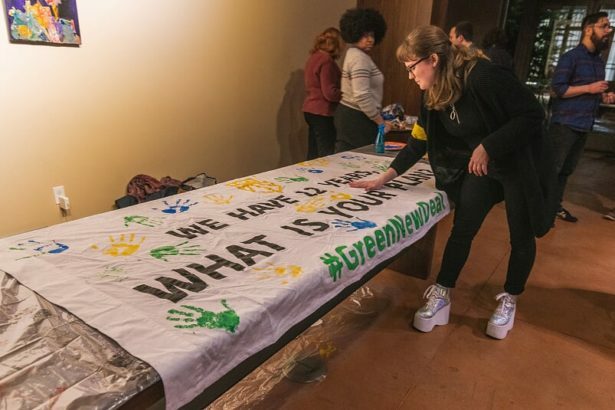 Like the early 20th century women’s suffrage movement — which decided not to include men in its pickets outside the White House — the modern Green New Deal movement is making strategic use of political theater to highlight a deadly serious injustice. By visibly pitting people with a unique stake in the climate fight against entrenched corporate and political interests, the movement is building a compelling public narrative. Many young activists have already witnessed the effects of a changing climate for themselves. Grimm, for example, was visiting family in Japan last summer when she experienced firsthand some of the extreme weather gripping the country. A July heat wave killed at least 80 people and sent more than 35,000 to the hospital. That same month over 220 people died in record-setting floods. “It stuck with me all summer that this is real, weather exacerbated by climate change is hurting families around the world,” Grimm said. Yet a common theme among Sunrise organizers talking about their experience is a feeling the Green New Deal has given them hope that the worst effects of climate change can be averted. It is disappointing not to see the role of the Green Party in pushing forward the Green New Deal in this article. The Global Greens began working on the Green New Deal in 2006 and formed a committee on the issue in 2007. While Obama mentioned the phrase, his energy policy was “all of the above” energy leading to a mass expansion of oil and gas infrastructure and the US being the largest oil/gas producer in the world — yet the author gives him credit, while he committed climate crimes. The first candidate to run on a full-fledged Green New Deal was Howie Hawkins a Green gubernatorial candidate in NY. Jill Stein ran on a detailed plan in both her presidential campaigns and many Green Party candidates have campaigned on the issue — yet, this article misses all that history. It is good to see the Sunrise Movement push the issue. The Democrats need to be pushed as the leadership is resistant and the Resolution introduced is more of an outline needing to be filled in. Right now, people can see whatever they want in the Resolution By the way, who is funding the Sunrise Movement? They have grown rapidly from an aggressive but small group we reported on in 2018. Has there been an influx of financial support? If so, from where? It is urgent that the government act to put in place a real Green New Deal that confronts the climate crisis. Every president since Bill Clinton has failed to rise to the challenge resulting in a climate disaster being upon us. **Scroll on by…we’ll FRY AND DIE… in a Global Cooking, intolerable to life +5°C world, of 2100! BIG O&G should be held accountable… and many cities are now claiming costs, for C.C. mitigation, prevention, damages! 200 students from small town Nelson, B.C. Canada…joined their international counterparts to “change Climate Change”…in order to have healthy lives on our beautiful planet, Earth! Soon forests, wildlife, and us…will have more C.C. trouble: 50°+C deadly heat waves, (i.e. now in Australia, where dead bats, koalas fell from trees; wild horses died when drinking water holes evaporated! Years of drought, bush fires, followed by 3 years worth of rain in 10 days: drowned cattle herds, wildlife in Queensland… from Climate Change! Ditto: California!) Global food and water shortages; sea level rising from melting Arctic ice, Methane gas (80Xs worse than Carbon Dioxide pollution!) from global permafrost, Antartica’s icebergs, glaciers, (our river/water sources! ), all melting… then rising oceans from1-60 metres, violent storms and more hurricanes, flooding coastal major population global cities, with a billion dead and C.C. refugees from mass starvation, clean water shortages, wars, and migration! 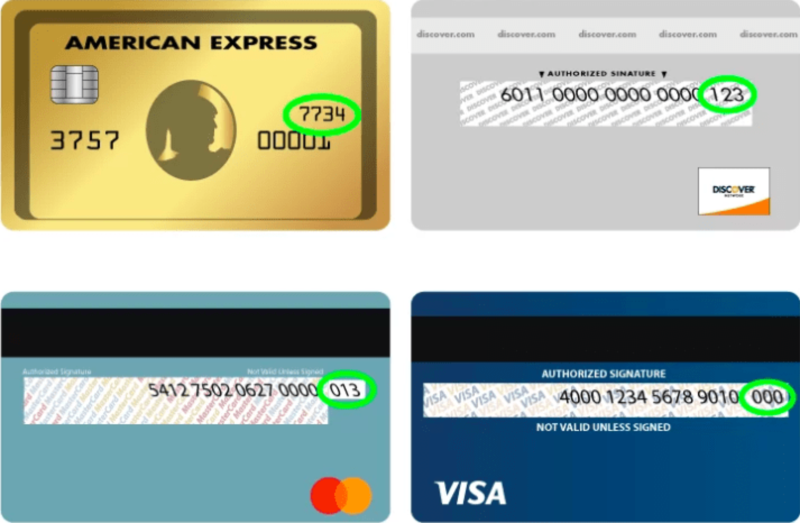 (NY, LA, London, Shanghai, Mombai, the “Lower” Mainland…! ), islands and beautiful beaches; acidic oceans’ bleaches/dead coral reefs; plastics eaten by, entangling ocean life; oxygen-depleted, algae dead zones; Florida Red Tide; whale beaching; massive fish and ocean life die offs! 20/22 past years are the globally hottest on record…yet people STILL DENY, “Global Warming”; mock Al Gore, David Suzuki, Noam Chomsky, David Attenborough…97% consensus of Scientists! There’s an estimated $11-70 trillion in global mitigation and economic damages losses, from O&G “Corps.” : their $trillions in profits from oil, gas, and coal exploitation! This is despite Oil and Gas Corporations KNOWING,… and governments’ in their big donations $$/CAPP lobbyists’ pockets… since 1960, that Climate Change was REAL…and would REALLY RUIN our beautiful planet! Some people, are still too blind to see the CRISIS… right in front of us! They talk of $$/ “economy;” our “hypocrisy…as we still use oil,” building of NEW KILLER F.F. infrastructure: LNG”Canada,” CGL, (with terrible trespass and jailing, on Wet’suet’en land! ), Kinder-Trudeau, Keystone XL, etc. pipelines, and ludicrous expansion of “dying, stranded assets, “fossil industry” …instead of Green energy transitions NOW! Our conveniences, comforts, resistance to “change…Climate Change” today…means we will sacrifice our (grand) children! GOOGLE: human-caused Anthropocene geologic era/6th great mass extinction age that we’re entering now…and weep for (apologize to! ), your (grand) children! A massive revolution of fossil fuel eradication/global GREEN NEW DEALS/Green energy (JOBS!) boom….are the only things that can save humans with only a decade left…and all other undeserving species…like Mt. Caribou, we’d take down with us! After the students’ rally, thanks for the supportive adults’ protest, (special thanks to some organizers, who attended the whole day, in the freezing cold wind, and that night’s Council Meeting! )…WHO CARE and are EDUCATED about the realities of CLIMATE CHANGE!